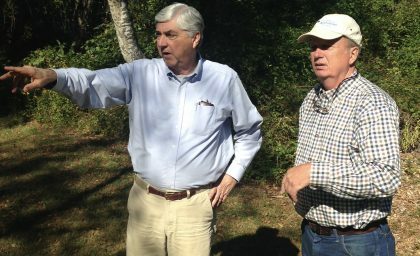 Executive Director Nelson North, left, discusses the Smith Richardson project with Milan Bull, senior director of science and conservation. October 28, 2016 – I had the pleasure of walking the H. Smith Richardson Wildlife Sanctuary in Westport recently. It’s a beautiful preserve, and these days much of its beauty lies in its potential. Smith Richardson is one of the five sanctuaries where we have habitat improvement work underway (Bafflin in Pomfret, Trail Wood in Hampton, Morgan Chaney in Montville, and Croft in Goshen are the others). Most of its south section is lush with native fall flowers and foliage – goldenrod, boneset, pokeweed, and wild grapes. But there are also weedy invasives like mugwort, bittersweet, and porcelain berry. 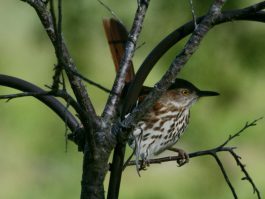 Those invasive plants are crippling the sanctuary’s potential to harbor birds and other wildlife. Standing out by contrast are two acres that were just as tangled with non-native vegetation. We recently got rid of the invasives, and what remains is a thin covering of dead branches, a few weeds, and a dozen stumps shorn to almost ground level. This fall, a grinder will get rid of the stumps. A tractor will rake away the debris. A disk harrow will prepare the earth. Come spring we will start to plant and by June the Connecticut Audubon Society’s newest pollinator meadow will be in bloom with flowers and buzzing with insects. Our seed mix includes purple coneflower, wild indigo, wild bergamot, New England aster, ironweed, milkweed, field thistle, blue vervain, and coreopsis. If you haven’t seen those in bloom in a wild meadow, you are in for a treat. The pollinator meadow will be the first major accomplishment in the longer-term restoration of the sanctuary, which we are working on in collaboration with the Friends of Smith Richardson. We will be removing invasives and restoring the sanctuary to young, shrubby woods, an increasingly rare habitat in Connecticut and one that is ideal for declining birds such as Blue-winged Warblers, Brown Thrashers, and Eastern Towhees. I mentioned above that Smith Richardson is one of five sanctuaries where we have habitat restoration projects (you can find information about all our sanctuaries on this page). At the Bafflin Sanctuary in Pomfret we are creating and expanding shrub habitat and also restoring grasslands,starting with a 100-acre test area for Bobolinks and Eastern Meadowlarks. Work is continuing at Trail Wood in Hampton to recreate the habitat conditions that existed when the writer and naturalist Edwin Way Teale and his wife, Nellie, lived there starting in 1959. At the Morgan Chaney sanctuary in Montville, our habitat restoration work is part of a region-wide effort to expand habitat for the New England Cottontail, a rare, endemic rabbit that was recently kept off the endangered species list because of habitat improvements. And we continue to management about 80 acres of scrub-shrub habitat at the Croft preserve in Goshen.